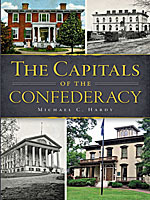 Hardy, Michael C. The Capitals of the Confederacy: A History (Civil War Series) . Charleston: Arcadia Publishing, 2015. 127 pages, notes, index, b/w photos, ISBN 9781626198876, $19.99. When it comes to the Civil War in North Carolina the name Michael C. Hardy will come to mind for many readers. He is the author of more than twenty books and dozens of articles. He was the recipient of the 2010 North Carolina Historian of the Year award and is a prolific speaker on North Carolina and in particular Civil War history. When it comes to capitals of the Confederacy many casual Civil War enthusiasts will only know of Richmond. In fact, many with extensive knowledge of the war might have to think hard in order to come up with the five cities included in this book. The five included are Montgomery, Richmond, Danville, Greensboro, and Charlotte. In order to have been considered a capital Hardy says a city must “…have been the scene of official business: meetings of the Confederate cabinet, issuance of official proclamations or other activities of the various branches of the government” (p. 7-8). The cities of Montgomery and Richmond were chosen while the other three were determined by the course of the war. Each of the cities included receives adequate coverage with Richmond encompassing the lions share as would be expected. In each city we see how the residents lived and were effected by war. We see the economies, health conditions, social aspects and more of the cities and residents. It is often times not pleasant. As the end draws near for the Confederacy the government, led by president Jefferson Davis, leaves the chosen capital in an attempt to keep ahead of Union forces but also to try to find a way to keep the fledgling government and country going. As Hardy effectively shows this became more and more difficult and the stays in cities became shorter as they moved further south. While in Greensboro Davis ignores the advice of his generals to try to negotiate peace and instead continues on to Charlotte. The narrative wraps up with the escape and ultimate capture of Jefferson Davis. The final chapter, “Looking for the Capitals of the Confederacy” is one of my favorites. This gives us a look at the cities in modern-day and what remains of the Confederate government. For some, such as Montgomery there is little left while Richmond is home to many sites despite the tremendous fires that accompanied the leaving of the government. Also included are other cities that have markers to the Confederate government. These are most often associated with the fleeing Davis. As the author points out each of the cities included has had at least one book written about their part in the war (see the introduction for solid discussion of other sources). No book however has attempted to do what this one has successfully done which is bring all the cities together under one cover. This is not a long book, with just over 100 pages of text. It can easily be digested in a sitting or two. The photographs are both vintage and modern and help bring the text into further focus. There are full end notes for those wishing to do further research. There is no bibliography but oftentimes in History Press/Arcadia titles there is no space for such. The notes however are complete enough for most any reader. Dunnigan, James F. The World War II Bookshelf: 50 Must-Read Books. New York: Kensington Publishing Co., 2004. 302 pages, index. ISBN 9780806526492. Along with Jesus Christ and the Civil War, World War II is probably one of the most written about topics of all time. So where does the beginner or casual reader jump in at? Author James Dunnigan, in what is now a rather dated work, gives readers a good point of reference. By dated, this book is now more than a decade old. Many top-notch pieces of history have been published since its release so it is important to not ignore other works, particularly those that are well reviewed and received. Note, I did not say those that have sold well. That is not a sign of scholarship but rather a sign of name recognition or good marketing and PR. A good seller may be an excellent work but pop-history does not always make for accurate history. Dunnigan provides a listing of 50 books he considered to be must reads. There is little to realistically quibble about. It is his opinion only. Complaints are based upon personal choices. The book is divided into five chapters; The Big Picture, The War in the West, The War in Russia, The War in the Pacific, and Larger Issues. Pretty straight forward stuff there. Most of the choices seem to have been well thought out. The problem being, there are only fifty book total. I for one would have preferred a more in-depth listing of books dealing with Nazi Germany. There is no biography of Hitler (even Mein Kampf did not make the cut) or any of his associates. The Holocaust is ignored. Dunnigan makes the statement that biographies and most individual battles are left out in order to concentrate on the larger picture. There is no larger picture in World War II than Adolph Hitler. Instead, we are treated to Soviet Casualties and Combat Losses in the Twentieth Century. Surely there can be better choices for the average beginners World War II library. In addition, the 78 volume The United States Army in World War II is going to be out of the reach of the average reader. Just my two cents on choices and as I said this is purely an opinion book. For me some of the reviews got lengthy and beyond what I was looking for. While some were very short, a page or two, others stretched on for nearly ten pages and became tedious to finish. As a further comment, many of the books listed are now out of print and must be found on the secondary market. Surely this is not a huge problem but is something to consider. These complaints aside, there is clearly value to Dunnigan’s book. For those, myself included, with a fledgling World War II library a guide like this can get us going in the right direction. From there it is essential to review the notes and bibliographies of our favorites and expand our reading list that way. Overall, recommended but with the above mentioned caveats.